HEAVY SPOILERS FOR BOTH FILMS! 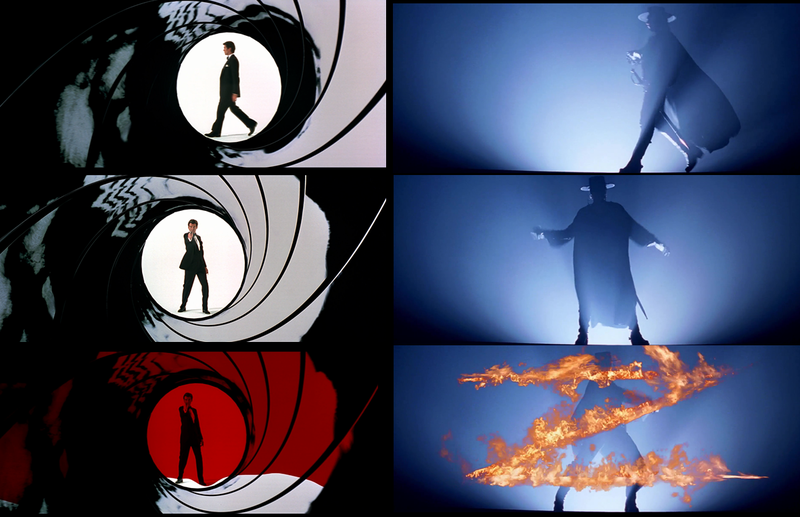 We all know James Bond's opening iris logo were he is seen -trough the barrel of a gun- walking and then surprisingly shooting his attacker as blood fills the screen. For an interesting and clever reason, Campbell (or someone in his team) decided to have Zorro doing basically the same as 007: walking against a blue background and carving his trademark 'Z' into the screen, which leads us to the title card. In GOLDENEYE, Bond breaks into a chemical warfare facility in the USSR around 1986. We only see his face shadowed and his figure running across a platform, jumping off a dam and sneaking into the facility's bathroom. Only then, his face is revealed seconds before he punches a Russian Captain upside down in the face, while he was in the bathroom (Zorro would use a similar move later in the film). A similar resort is used in THE MASK OF ZORRO. We are in a California square in 1821, where Governor Rafael Montero is threatened by a crowd of peasants who want to finish with Spain's ruling of their region and the tyranny of the governor. A cold-livered Montero refuses to leave, captures three innocent peasants and puts them against a firing squad. At the same time, everyone is wondering were Zorro is. We get the first glimpse of his face as one of the kids in the crowd, Joaquín, recognizes him trough a monk's outfit. Bond and his friend Alec Trevelyan (006) infiltrate the facility's bottling room and set up explosive charges. An alarm goes off. Trevelyan is captured and shot by General Ourumov, whose troops have surrounded the place and command Bond to surrender. 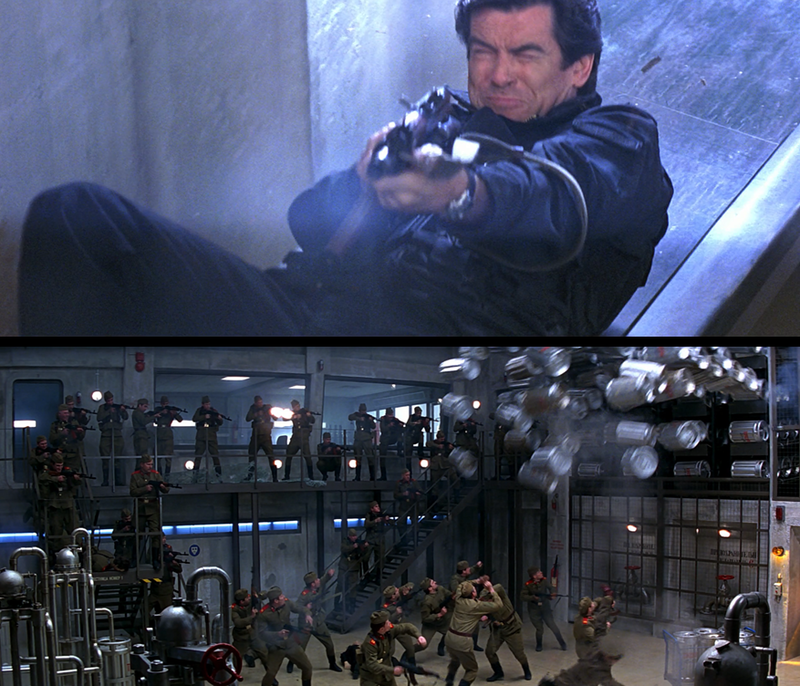 In order to escape, Bond shoots a container holding gas canisters in the superior part of the room. The canisters start falling one after another, severely wounding the surprised Soviet troops. Zorro does pretty much the same: as he observes the firing squad is about to shoot the peasants, he catches the soldiers' weapons with his whip, redirectioning them to the corporal giving the execution orders. 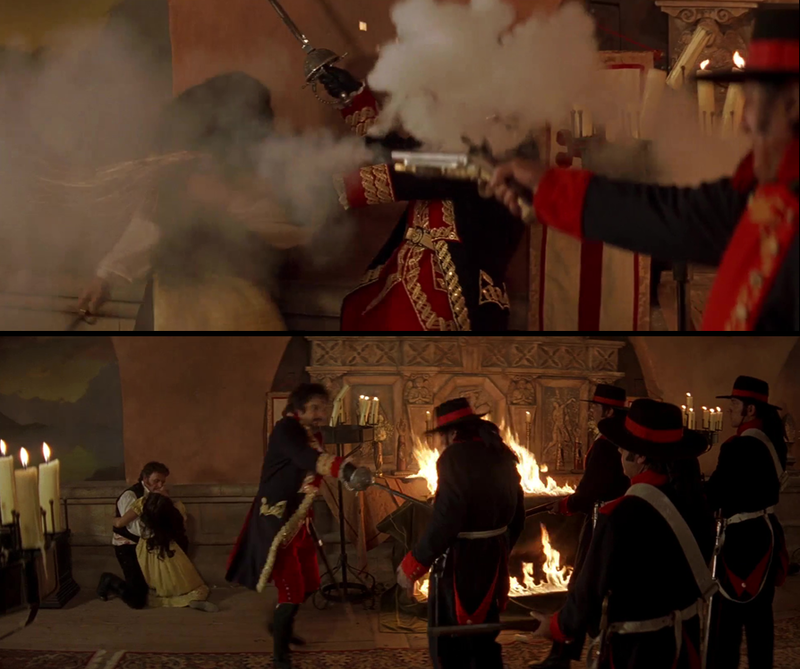 Later, as a group of snipers are about to shoot him, Joaquín and Alejandro (the kids in the crowd) throw a statue from a superior platform over the snipers, allowing Zorro to escape. Then, the masked hero confronts Montero, warns him to leave California, and marks a zed below his chin with his sword. Before Bond escapes the plant, he takes cover in a small container filled with gas tanks. Despite Ourumov's orders not to fire to avioid blowing up the tanks, a desperate soldier shoots and misses Bond, almost hitting one of the tanks. 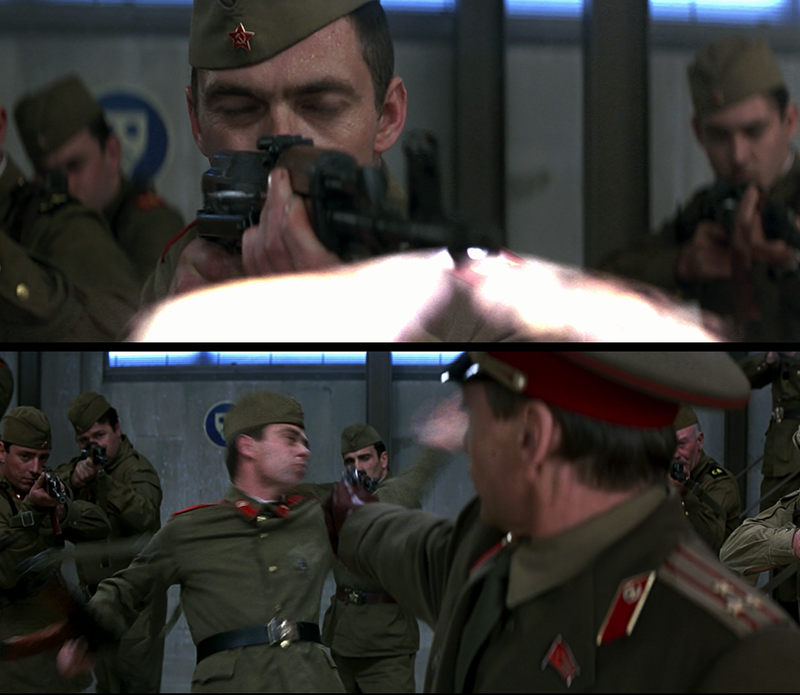 A furious Ourumov shoots the soldier at point blank. 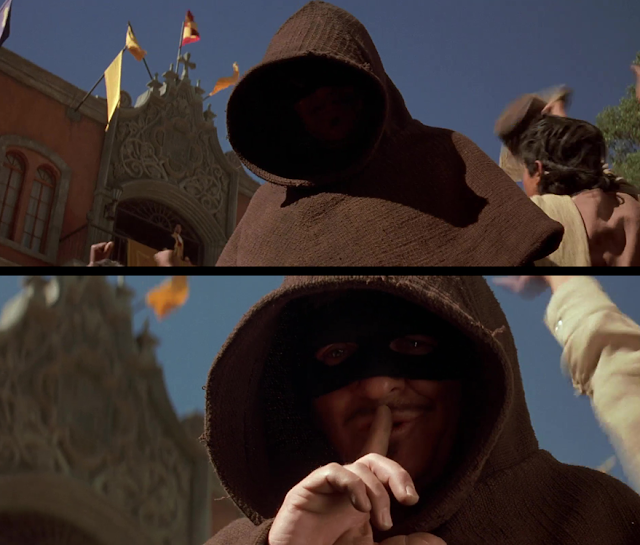 Don Diego De La Vega -aka Zorro- returns to his home with his wife Esperanza and his baby daughter Elena, only to find Montero and his troops threatening him. 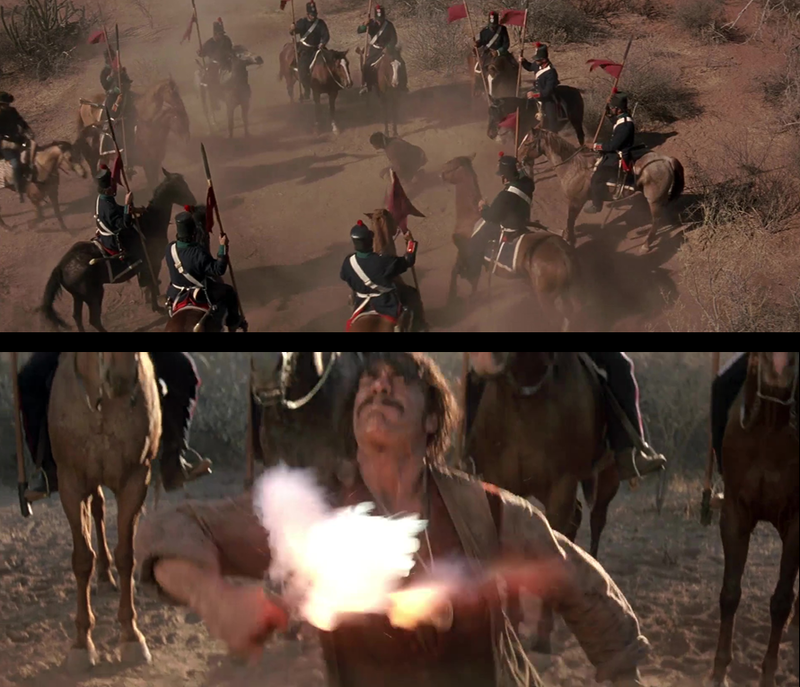 As they are about to arrest him, Esperanza intervenes in the fight to protect Diego and is mistakenly shot by one of Montero's soldier, killing her instantly. Montero, who has secretly desired Esperanza for years, stabs the soldier with his sword. Later, Diego is finally captured and Elena stolen by Montero. Both GOLDENEYE and THE MASK OF ZORRO follow on the story decades later, nine and twenty years, respectively. In GOLDENEYE, Bond is driving his Aston Martin DB5 trough Monaco. 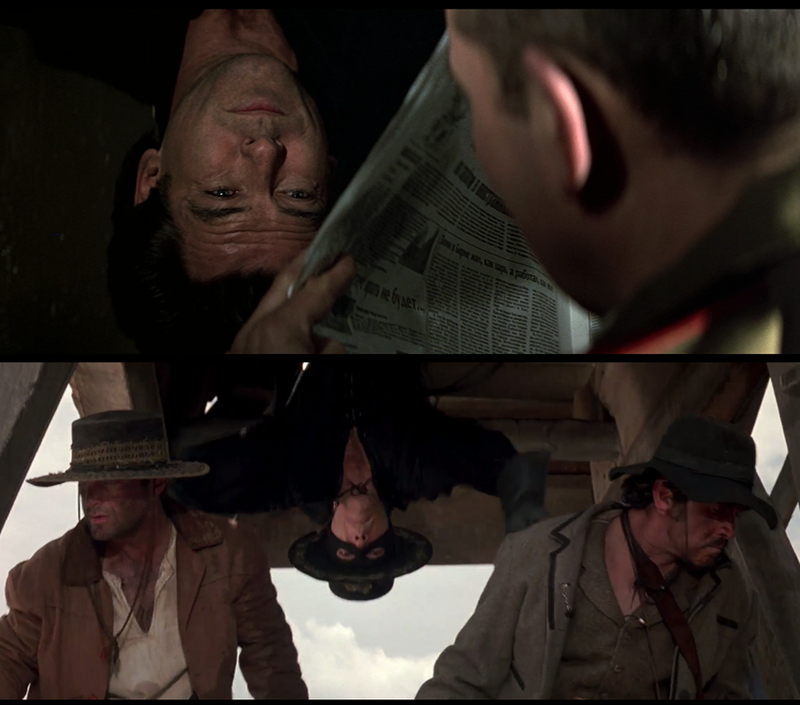 In THE MASK OF ZORRO, we are introduced to the second story of the film: the Murrieta brothers (Joaquín and Alejandro, the kids from the square crowd) being captured and surrendered by a bounty hunter known as Three-fingered Jack. Jack and the Murrieta brothers are surprised by Captain Harrison Love, a California Ranger in league with Rafael Montero. Jack is shot, but survives as the brothers try to escape. As they were running, Joaquín is shot in the back. Alejandro wants to save him, but he pushes him back as Love and his men behind surrounding him. Before being captured, Joaquín shoots himself. 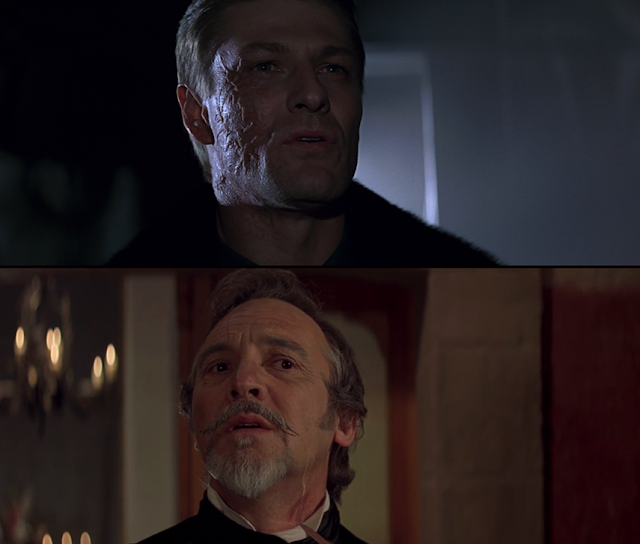 Alejandro later escapes and reencounters Diego De La Vega, who has managed to escape prison and is planning the return of Zorro. 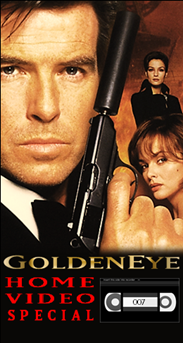 The death of Joaquín and Alejandro's inability to save him or avenge him would be a recurring subject haunting the hero as in GOLDENEYE with Bond and Trevelyan (albeit in a much subtle way, as we can see during the M's briefing scene). Moreover, the death of Joaquín is a bit similar to the death of 006: surrounded by guards and a high ranking officer threatening him. 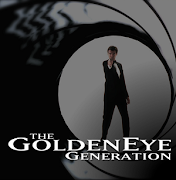 Later in GOLDENEYE, Bond is resting on the Grand Europe Hotel and is attacked by Janus operative Xenia Onatopp . They end up having a fight in the sauna room of the hotel with a very horny -almost sexual- content. 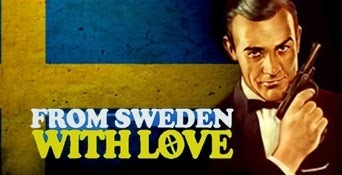 Finally dominated by Bond, she reveals the whereabouts of Janus, the mysterious man 007 has been sent to investigate. In a much lower-key moment in THE MASK OF ZORRO, Alejandro Murrieta (who has been now trained by Diego to succeed him) infiltrates Montero's residence. After making an incredible escape that includes all kind of stunts and sword manouvers, Alejandro is intercepted by Elena, who has been raised as Montero's daughter. They fight with swords, but the showdown ends up being a seductive game where Alejandro carves Elena's dress to the point of leaving her naked. Led by Xenia, 007 agrees for a blind date with Janus in an isolated statue park in St Petersburg, Russia. "Hello, James", a voice calls from among the shadows and a shine of light illuminates his face: it's Alec Trevelyan, the former 006. 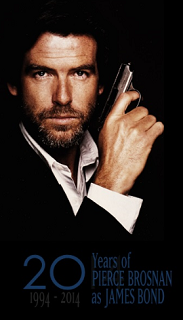 He wasn't dead and everything was a ruse planned from the beginning to betray the British and the fact that Bond left him to die. 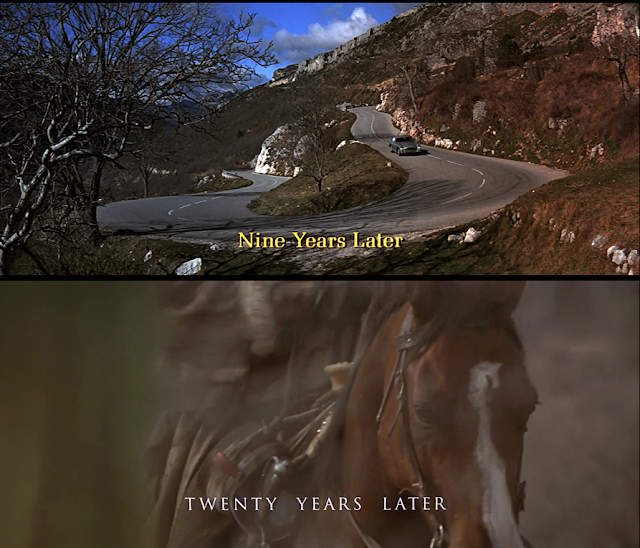 Much like in GOLDENEYE, in THE MASK OF ZORRO we have Diego surprising Montero twenty years after their last encounter. 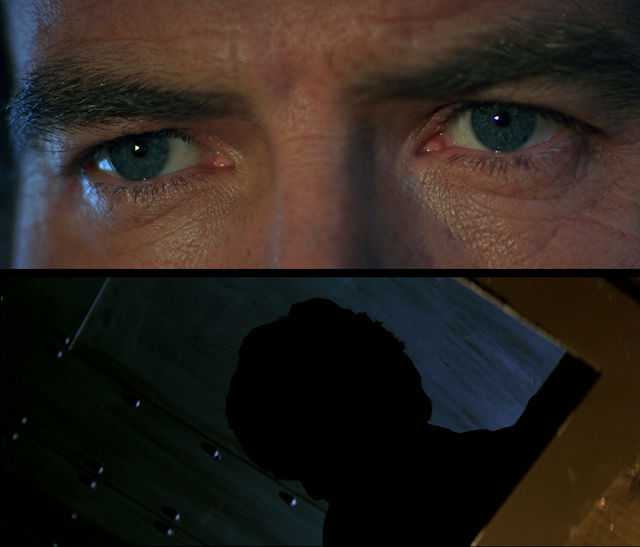 The chiaroscuro cinematography, in both cases by Phil Méheux, is very similar. Just like Trevelyan -but in the side of good- De La Vega seeks revenge for the damage Montero caused in the past, mainly the death of Esperanza and the kidnap of Elena. He is later captured by Rafael's troops, but manages to tell his daughter the truth. 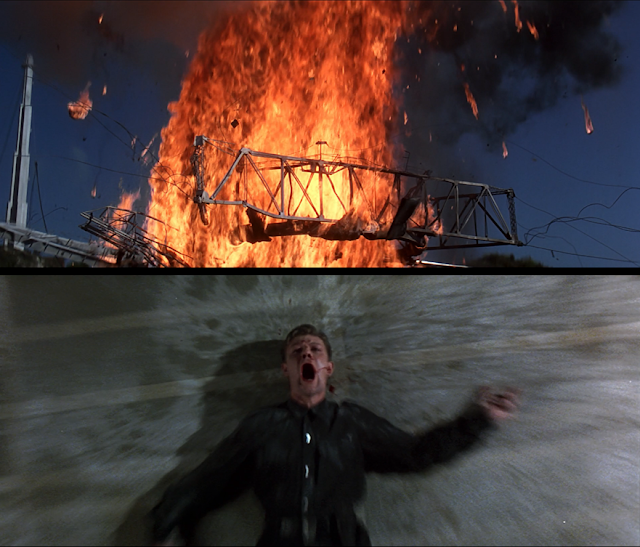 When we see Alec Trevelyan in GOLDENEYE, nine years later, half of his face has been burned for the explosives set up by Bond in the nerve gas plant. 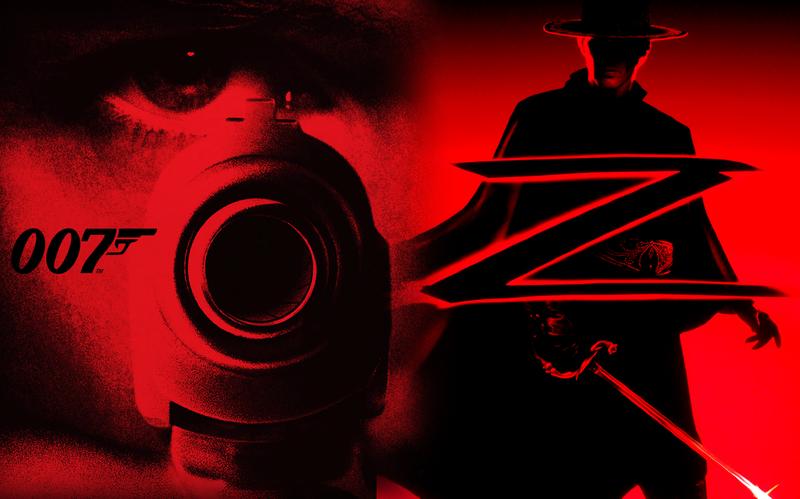 In THE MASK OF ZORRO, Montero, twenty years later, he bears the 'Z' carved by De La Vega below his chin. Bond and Trevelyan have their final showdown on a giant telescopic antenna in the middle of the Cuban jungle. To prevent Trevelyan's plan from succeeding, Bond uses the piece of a scaffolding to jam the antenna's rotating system. 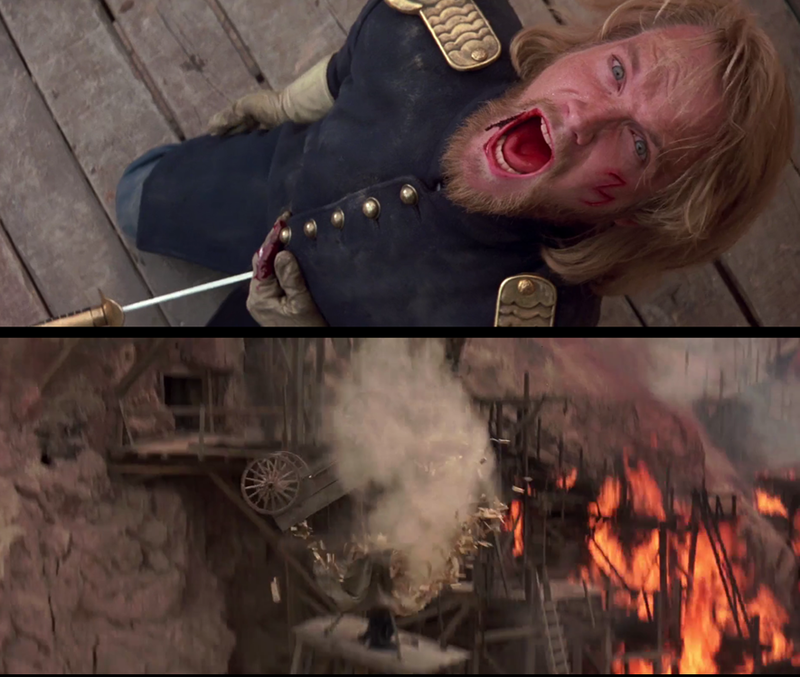 Zorro does something similar using a ladder to prevent a lift transporting gold bars in a mine Montero and Love are planning to blow up. Beg you pardon, forgot to knock! 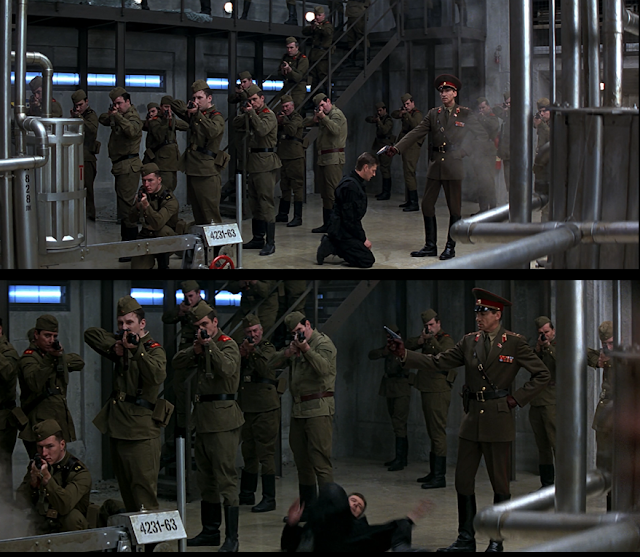 As we were saying before: Bond's first appaerance in GOLDENEYE has him sneaking into the vents of a bathroom, surprising a Russian captain and (upside down) punching him in the face. During the mine showdown, Zorro/Alejandro does the same move with two guards, punching him upside down from a platform. Capitain Love meets a similar demise than Alec Trevelyan, both are "killed twice" by their enemies. 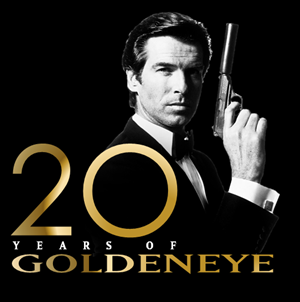 In GOLDENEYE, Bond is fighting Alec on a small platform belonging from the antenna, in the same way Alejandro and Love fight each other on a platform belonging to the mine in the climax of THE MASK OF ZORRO. Alejandro fatally wounds Love with his sword, grapples to safety with his whip and leaves the captain to die. The ranger is finally killed when a carriage with gold bars falls over him. In the case of Trevelyan, Bond lets him fall off the platform after a fist fight. The former 006 is still alive, until the antena explodes and the full structure falls over him.